C1103. ARTUR RODZINSKI Cond. 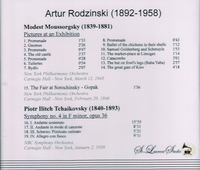 NYPO: Pictures at an Exhibition (Mussorgsky-Ravel)), recorded 12 March, 1945; The Fair at Sorochinsky - Gopak (Mussorgsky), recorded 20 Feb., 1946; Rodzinski Cond. NBC S.O. : Symphony #4 in f (Tschaikowsky), recorded 2 Jan., 1939. (Canada) St Laurent Studio YSL 78-082. Transfers by Yves St Laurent.